Just over four years ago, two married couples, myself and Oisín, and our childhood friends, Aoife and Gavin, sat around a table with a wonderful idea for a business but absolutely no money to make it happen. With Ireland hit hard by the recession, all of us were genuinely facing imminent emigration - then my mam stepped in. Having given up smoking nine years previously, she'd saved the money she would have spent on cigarettes, a total of €8,500, which she gave to us. She wanted me to stay in the country but she also believed in our idea and wanted to be a part of it. That was how the Irish Fairy Door Company got started. Since its launch on Facebook in August 2013 we've gone on to sell 500,000 products in Ireland and around the world. We've distributors in Australia, the UK, Mexico and North America and have shipped fairy doors to over 100 countries. We employ 12 people in Fairy HQ in Dublin and now have over 60 products starting from €4.95 to €30. Our entire production went to China in 2015 as, in order to sell into the retail sector in the USA, everything needed to be compliant with their children's toys regulations. Although we were apprehensive at first, it was a very good move for us as it enabled us to massively ramp up production. The magic of our products and concept are still very much being worked on and improved on by our staff here in Ireland, so our authenticity is still very much there. 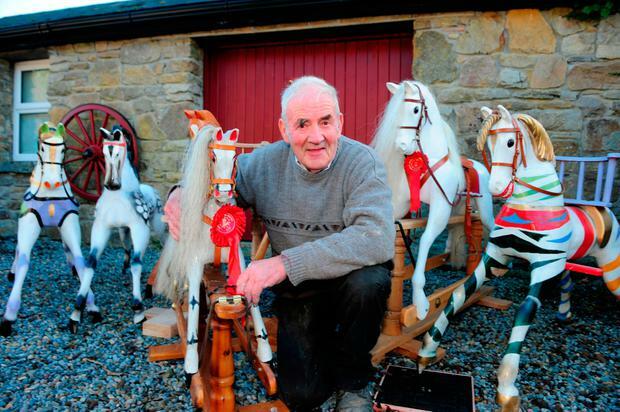 When I retired, I had more spare time on my hands and, about 10 years ago, Old Bill, a German engineer who lived next door, came into me with an old toddler rocking horse and asked if I thought I could make a few. I took on the task and it soon became a labour of love. 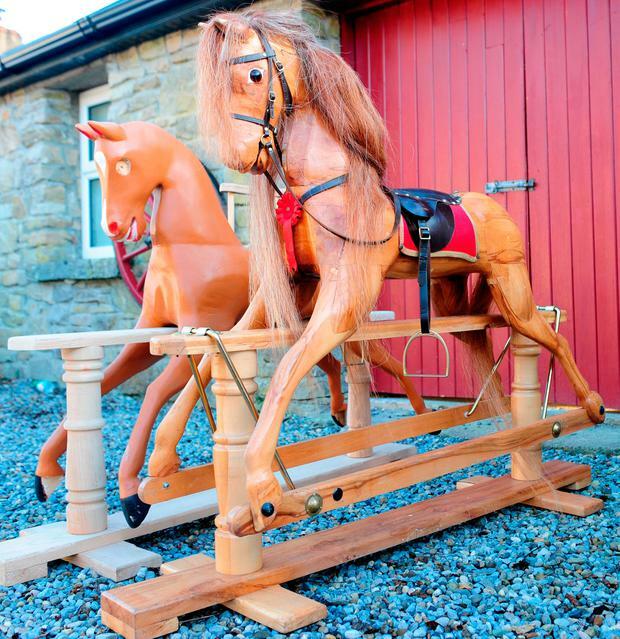 I didn't have a rocking horse growing up myself but, since doing a bit of research on traditional toys, I've discovered the rocking horse is without doubt 'King of the Nursery'. I reckon there are now about 24 horses in homes around Ireland (I sell about five a year) and this year Santa will be delivering horses across the country - Christmas is our best time of year. My latest new product is a carousel-coloured rocking horse in zebra print which makes for an interesting variation. But in general, the design of a rocking horse hasn't really changed since the 1800s. It takes about 80 hours to carve and complete each horse and all my woods are native species: oak, ash and beech, all planked and kiln-dried by my supplier at Geashill, near Tullamore, Co Offaly. Years ago, I was sitting in a restaurant on holiday in Spain when I saw a young child ride past on a small bike with the pedals removed. I got a napkin and a biro and drew the idea out there and then but it was just the beginning of years of research. I tried making different shapes of bikes and wheels and sent them out to family and friends for feedback. When I finally made my prototype, runbikes were just starting to become popular so I knew it would be a challenge, but I had confidence in the model I designed and I knew I was the only one in Ireland actually making timber runbikes and not importing them. All Ro Óg products are developed from requests or ideas I've had. For example, the Ro Rocker came as a result of fixing a rocking horse where I was told that small children tend to hit their teeth and face off the head of the horse. I was asked for an alternative to counteract this problem yet still have the rocking animal as part of it. The Ro Óg Balance Board can be used as a toy, for physiotherapy, or for occupational therapy. I had to get advice from physiotherapists for it to make sure it was safe to use for people of all ages. Bringing a toy to market takes a long time and a lot of research. I make prototypes and get feedback initially from my five children. If they play with it or make suggestions, then I evaluate that and make a second prototype with the changes incorporated. Then it goes back to them again for their opinion and if they're happy, then I give it to some family and friends for feedback. The final design has to be submitted for testing and I use high quality birch plywood that is best suited to the manufacturing process. My philosophy is to make high quality timber products that are CE Tested, safe, sturdy, easy to use and stand the test of time. I believe this is done by fostering excellence in manufacture and cost effective, creative eco-friendly design solutions. But this is a concept that can take time to take hold: the idea that you're investing in a toy that can be passed from one family to the next is something that has to be nurtured. I'm a practising architect and my dad is a consultant engineer but around Christmas we definitely feel like elves making all the toys. I don't think it's possible - and we don't try - to compete with big brands, but I think we have a different market and it's good for kids to have a mix of toys. I also think people are more likely to hang on to wooden toys, they age more gracefully than plastic ones and can be repaired and painted rather than thrown out. Myself and my sister always had wooden toys mixed with plastic ones, but I always remember the wooden ones, in particular a farmyard that dad made from leftover parquet flooring. Our business started in 2013 when I was working on a design project and needed to get a chair cut out with a CNC machine (computer numerical control) near Bray and couldn't fit the plywood in my car. Dad very kindly helped out and saw the CNC machine in action - it was love at first sight! We bought our own CNC machine shortly after. All the design and making is done in our studio in Sandymount and we use Irish hardwoods, mainly from fallen trees. It's a slow process - something between a business and a hobby. Ideas for products can come at any time but I get a lot of inspiration from nature, and we design and make a lot of animals. Price-wise products are between €25 and €95 and our most popular toy is a simple, stackable owl. A few years ago we designed some fish that we found hard to sell but when we stopped making them people started asking about them so now they're back on the market again. I love going to markets or fairs where you can have one-on-one interaction and see people's eyes light up when they see the products. But the business is now a global one. We've shown products at the New York, Dutch and London Design weeks. Just recently we sent 140 sheep to America as well as fish and whales to Italy and Germany. It's great to get emails and instagram photos showing toys in their new homes. Lots of people pretend they're buying the product for a child but then admit it's actually for themselves! Tomorrow night, Santa will be delivering Red Rufus's in Canada, America, France, Spain, the UK and, of course, in Ireland. In Christmas 2009 I decided to make my children a sockdog of Rufus, something that took me forever. I was still beavering away at it on Christmas Eve, but that original Sockdog was a huge hit and friends started to put in orders for one. The business has grown organically ever since then with every leap forward bringing its own challenges. What I'd been doing career-wise before was very different. I'd lived in London where my jobs as a PA were high profile and varied (Conservative Central Office, Hyatt Hotel Group, Spencer House). But once I had my first child, Genevieve in 1997, I stopped working to be at home with her. Magnus followed in 1998 and Josie in 2001. We'd left London in 1998 to move to Moscow and in the last 19 years we've lived in five different countries because of my husband, Mikal's, work. Our first doll was launched as a response to the body image issues that were starting to filter down to small kids. It was important to me that children could relate to our dolls, so our dolls look like kids and, in a subtle and age-appropriate way, we've tried to touch on the everyday challenges that children face. We've dolls with glasses and we've tried to tackle gender stereotyping with toys encouraging outdoor play, fishing, body-boarding and fossil hunting. To promote STEM we launched a stargazer doll who actually voyaged alongside astronaut Tim Peake to the International Space Station. We get lots of emails and suggestions. In fact, to date, eight of our dolls have been based on ideas sent to us by kids. 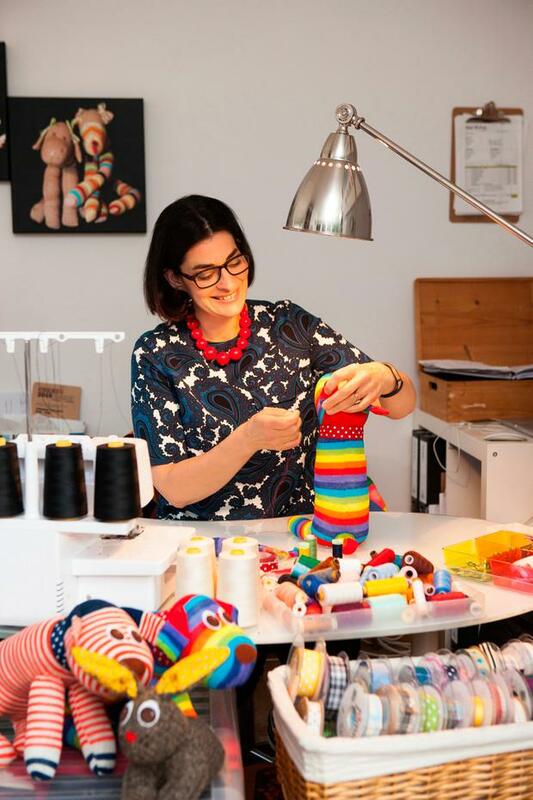 The decision to create Lottie dolls was a personal one. When choosing gifts for my family and friends' kids, I didn't feel comfortable with any of the dolls available, which all seemed to be either vampires or saccharine princesses with nothing in between. But it also felt right to establish the business in Ireland. During Lottie's early days I was living in London and working from my kitchen table but I quickly made the decision to return home to Donegal. I needed to recruit and, at the time, Donegal had one of the highest unemployment levels in Ireland. It just felt right to try and create jobs in my home county rather than in London.